Quite sometime back I wrote a blog entry on apt-pinning to mix multiple repositories in debian and prioritize them. Recently, I felt the need to do the same on my raspberry pi. I use rsnapshot to backup remote systems. Rsnapshot has an associated perl script which is meant to send beautiful reports via email at the end of the backup. The script in the version which came with raspbian was broken (1.3.1-4+deb8u1) and I needed 1.4.2-1, which is available in Debian Stretch. Following my earlier post, I performed the following steps to perform the installation of the required version without impacting the rest of the system. As you can see that the priority of Jessie is higher than that of Stretch, which will ensure that the system does not get messed up when you do an upgrade. Please be careful before performing these steps in a production system. I was installing ansible on OpenSuSE Leap 42.3 machine and faced a problem with multiple python versions. I have both python 2.7 and python 3.4 installed on this machine. Python 2.7 is the default one. I tried installed ansible with the usual pip install and was faced with an error related to setuptools (could not capture the error message). I upgraded my pip version to the latest one 10.0.1 and then installed ansible. After that I ran an ansible-galaxy init command to create one of the roles and I was welcome with the error stating “Error: Ansible requires a minimum of Python2 version 2.6 or Python3 version 3.5. Current version: 3.4.6”. And I was wondering what happened because my default python version was 2.7. The usual google search did not help me go anywhere. So I looked at the /usr/bin/ansible file and found that it was using python3 interpreter. I then checked the source of pip command and found the same thing. Now when I reinstalled ansible, it installed the correct python interpreter for my system. In all probability all this was my fault and I think the pip which I upgraded in the beginning of this process may have been installed for python3 by me, otherwise I do not see any reason for all these issues. Still I thought to share this entry, just in case someone can be helped. In DockerCon2017 Oracle announced the availability of Oracle containers in the docker hub. This was a great step forward. I have been thinking of trying Oracle in docker from quite a while for some personal projects, but was not finding time to experiment. The availability of docker build files on github made this task easier. 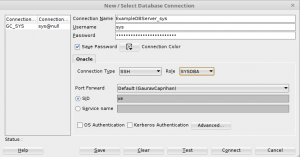 You would still need to download the Oracle Database files from OTN and place them in the prespecified directory. I tried 11g R2 XE and it was successful. The instructions provided are quite decent so I am not going to explain everything here again. I am running Docker 17.04.0-ce on OpenSuSe Leap 42.2. While building both 12c and 11gR2 containers I was getting “HEALTHCHECK Unknown flag error”. This is because HEALTHCHECK option was made available in Docker 17.06 onwards. As suggested in this issue, I simply removed the following line from the Dockerfile.xe and then the image built flawlessly. Following is the quick sequence of steps I followed to build the image and to test the connectivity using sqlplus from the container itself. Next I am planning to get a container running tomcat with ORDS on it. Stay tuned. I was running some playbook today and realise that the command line arguments of ansible-playbook do not behaves expected. However, this does not happen and the playbook still tries to connect as the user defined in the yml file.